Practice what you preach. Here at P.E.T.E.S. we realize the importance of saving energy, that is why we became Sharp Solar Certified and we installed a solar system on our own building. We are happy to say that our business is powered in large part by solar energy. Whether you are designing a system for a business or for your own home, we can help. It truly is an investment in the future, not only are you helping conserve energy, you will get paid back every month in reduced energy bills, helping offset the initial investment. Still need to be convinced, see below for reasons to go solar now and become POWERFUL. Savings Every Month. A solar electric system powers your home so you use considerably less electricity from the public utility. Hedge Against Rate Hikes. Offset energy prices and unpredictable rate hikes by generating your own free power for decades. Protect The Environment. Most electricity is generated by burning coal that emits pollutants into the atmosphere. Solar electricity comes from a clean and renewable source—the sun. Installation Expertise. P.E.T.E.S. certified installers ensures that there’s a solar expert close to you, ready to come to your home to determine your energy needs with a free consultation. Increased Property Value. 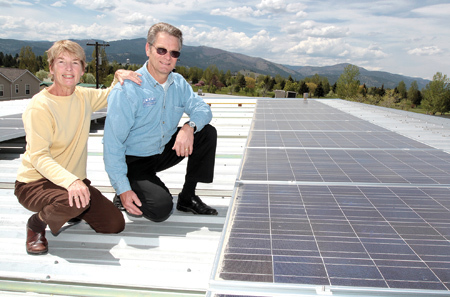 Solar is a smart upgrade that makes your home more desirable and valuable. Browse around our various completed project portfolio, maybe we’ve already done something like what you have in mind. Check out the PETES Electric App! Recycling Hours are Monday through Friday 8:30 a.m. – 4:30 p.m. I Want My Custom Home Theater To Do Everything! Why upgrade to HDMI 1.4?